In one sense, a full house of finishers could be seen to justify the decision to move from a 3am start to 9pm the previous evening. But in contrast to the 300km brevet last November, the weather concerning us at the start certainly wasn’t heat. Whilst the entire Cape were celebrating the arrival of some much needed rain, eleven hardy Cape Randonneurs were kitting up and heading out to Vrede amidst varying levels of downpour. The rain had at least stopped by the time we gathered for the pre-ride formalities and rolled down the driveway, but it was hardly a promising forecast. An ominous ring of clouds loomed over moonlit mountains all around us as we made our way towards Franschhoek. Together with the occasional scattering of stars peeping through the clear patches, it would have made for a rather beautiful scene if it didn’t also represent the very real possibility of a drenching with a long cold night of riding ahead. The pace of groups on Audaxes varies so much that it’s never really possible to write a report that sums up the multitude of different stories and experiences of rider’s at different places on the route. This brevet presented possibly the most extreme case of that we’ve ever experienced. 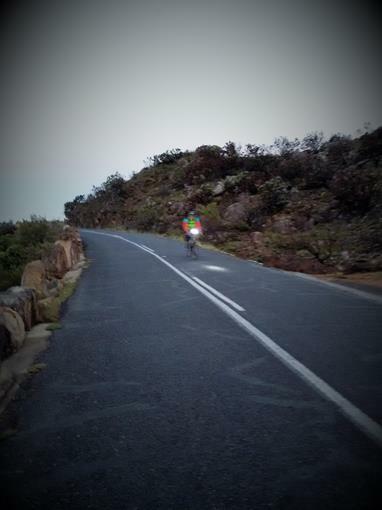 Up ahead the front group rode into a band of heavy rain on Franschhoek pass. The group of remaining riders passed those same roads without so much as a drop from the heavens. There was still plenty of surface water though, and combined with the always treacherous railway lines made for yet another fallen rider. Markus became our third rider to taste the tarmac on this stretch. Thankfully both he and bike, whilst battered were unbroken and able to continue. A few remaining clouds scudded across the summit of the pass, but as the route wound down the weather began to lift taking with it any last threat of rain. Descending the still damp roads required attention though, which was not always easy as the cold started to bite into the hand control needed for careful braking. Eventually all were down safely and heading towards the first control at Villiersdorp. Along this stretch came the first indications of the actual weather which was going to plague us – not heat, nor rain, but that most dreaded of all – wind! A lone pub was still open as we rolled through the near deserted main street. Fortunately our regular control of the 24hr Shell Garage was open for water refills, and even better was seeing the owners had fixed the coffee machine. The coffee has not improved sadly, but it was warm and contained traces of caffeine, which at the wrong side of midnight on a cold night was very welcomed. We were entertained by our own support crowd too – in the form of a drunken bergie, who alternated mutterings on why where we riding at night and begging for money. Leon was only in his cycling top. I caught up with him at Villiersdorp and was able to loan him my extra windbreaker to get his core temperature up again. Interesting thing – at the evening prep I was wondering whether I should take it with. Sixth sense maybe! 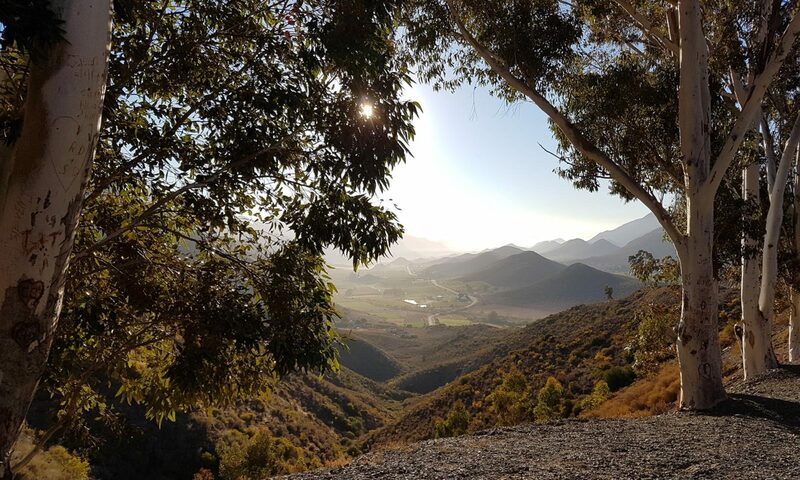 There was not a lot of enthusiasm to rush back out from the control, but eventually the group rode out as seven riders again and stayed together through Slanghoek valley and onto the foot of Bainskloof. There were occasional sheltered spots from the wind, but for the most part it was more of the same – battling through the headwind. The pass itself was at least sheltered, and as the road rose up the first light of the new day gradually began to pick out details of the hillside around. By the summit the Boland farmlands below were bathed in the early dawn light. It seems hard to believe, but the road surface on the way down seemed even worse than the ride a couple of months ago. It was a jarring, jolting descent with gradually numbing hands. At least there was hot chocolate, coffee, and hot food available at the Shell Garage in Wellington, our usual choice of control. Although notably, they don’t have a toilet – something somehow we’ve not noticed before! The stretch to Hermon saw a gradual separation and regrouping of riders, again pestered by headwind but without quite the same force as the night time section. It must be said that the wind was infinitely preferable to the 40 degree temperatures of the last time we rode this stretch. At the Riebeek West control, Theunis, myself and Markus decided a proper sit down breakfast was in order whilst Gideon, Ernst, Ingrid and Richard pushed on. It’s debatable who made the better decision. Despite not having French Toast on their menu, the Ox and Wagon pub obliged our taste buds and served up delicious helpings covered in bacon and syrup. On that count, ours was a good call. However, a quick weather check revealed some alarmingly familiar news – the wind was predicted to shift South East by 11am. Despite getting back on the road again at learning this news, we were too late to avoid this cruel fate. By the time we rolled into Malmesbury, any hope of a tailwind home had disappeared. We were at least greeted by a couple of club mates, Desiree Naude and Sue Kirk, who had turned out to support us and cheer us away on the last leg home. Incomparably better to our alcohol fueled cheerleader from ten hours earlier. Very few words come to mind about the final 50km home apart from “painful slog“. And yet again, vastly differing conditions were experienced by the various groups on the road. I’m sure faster riders, possibly even the four who skipped breakfast in Riebeek West, managed to avoid yet another dreaded battle against wind along the R304. Not so sadly for Theunis, Markus and myself. Two good things did come from the onslaught though. The first was the superb teamwork of my fellow riders. Despite varying degrees of fatigue, everyone took their turns on the front sharing the workload out for the whole 50km stretch. The second is my resolve to re-plan the 300km so we never have to ride this stretch again. The next Cape 300km brevet may still have headwind, but it won’t be on the R304 from Malmesbury. It’s surprising how the same ride can be so different each time – and this one, despite the lack of heat or rain, was certainly an unexpectedly tough one.